While the internet, IP technology and bonded cellular networks have radically and positively changed the way ENG is performed, too often broadcasters are connecting field and studio via unsecured, broadband infrastructures they have little to no control over. Current infrastructures often suffer from lack of broadcaster control, contested cellular bandwidth, complete lack of cellular access in some locations and high usage costs. The big disadvantage of bonded cellular is that the digital link most organizations are relying on, can vary widely in performance and reliability. As demand for bandwidth increases, commercial users of public frequencies have even less control and are more at the mercy of the cellular carriers business strategies. There is a direct correlation between the demand for unlimited cellular data and decreased mobile speeds. Unlimited data plans are slowing down mobile speeds for Verizon and AT&T customers, according to data released by mobile network measurement company OpenSignal. The more users and plans offered, the greater the congestion will be for cellular networks. There are several key benefits of leveraging licensed broadcast spectrum assets. These include no reoccurring opex expense, extended IP workflows, automation in the field, and no need to tune in microwave shots. This high-speed multi-use capacity provides dependable, high-quality transmissions. In addition, users gain the security and predictability that comes with a privately managed IP network, and the ability to perform tasks such as editing and prompter updates from the field along with compatibility with MOS protocol-based news systems. A high bandwidth IP connection created via the network can be leveraged to further enhance news production values through high-speed file sharing, as well as enabling all other IP-centric tools in remote locations such as phone systems, closed captioning, automation and remote asset management. IFB and talkback/comms can also use the link. A crew in the field can access the studio network via secure Wi-Fi or a wired connection in the truck, allowing the studios time-sensitive social media accounts to be updated from the field. Packages can be created using recently-captured clips from the field in combination with studio assets such as studio feeds and media archives. Only field clips and the final edit need to be uploaded prior to conforming with studio content. A bi-directional, high-speed IP wireless data link utilizing reliable BAS spectrum can be used without fear of contention, congestion or blocking. These connections are also low latency and high bandwidth, with large data rate increases with MIMO uplinks and downlinks, combined with adaptive modulation. IMT-Vislinks newsnet solution directly addresses this move towards IP. It has the ability to reliably increase the number of live ENG transmissions and workflows that can be performed from the field. The results are higher production values, lower operational costs, workflow efficiency through doing more with less and channel resilience provided by the use of the BAS-licensed spectrum and the dynamic allocation of bandwidth to the most important transmissions. 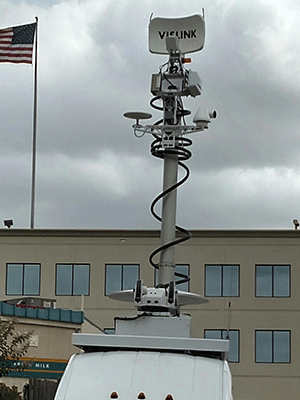 The system consists of one or more mobile high-speed IP network nodes that easily connects with a base station automatically and without logistical support from the studio technical operations group, typically located at existing ENG receive sites. Each mobile node not only offers high-quality video transmission capability, but also a private and reliable ingress point for other IP-centric edge devices, allowing users to control their own private high-speed IP licensed wireless network and ensuring that their content news gathering workflows and intellectual property are never at risk. This next wave of IP-centric ENG workflows has the potential to be a key tool for broadcasters seeking to maximize their coverage while fully leveraging studio assets and delivering a more engaging and immersive experience for their viewers.